If you are looking for the best dog door for cold weather, then we have some great recommendations for you. Out of hundreds of models in the line, Dr. Fox has selected several of the most popular ones and would like to share them with you. 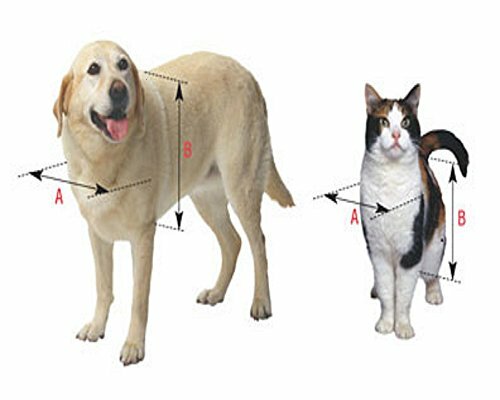 The Ideal Pet Products Telescoping Frame is the first product that you should take a look at. 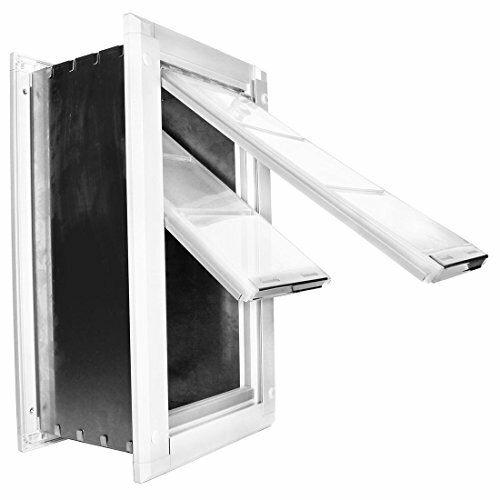 Besides being secure and easy to be installed, this item has a telescoping frame. This means that your dog will have a stylish entrance just for him or her if you choose this model. It is also useful that the unit has a door that slides down over the flaps, which means that your dog will not be able to get out of the house if you do not want this to happen. Nevertheless, if this product is not the one that you have been looking for or if it is already out of stock, then you might want to take a look at the BarksBar Plastic With Aluminum, as it is also a model that has great reviews of dog doors for cold weather. Being made from structural foam molded plastic, this product will be very easy to install and will undoubtedly make your dog love it. It is characterized as having a telescoping frame. If your dog does not weigh more than 90 pounds, then this model may be a good choice for you and for your house. It is very tricky to buy dog doors, because you have to measure your puppy carefully. If you make a mistake and buy this product but your dog weighs more than 90 pounds, then it will be of no use. This well-designed dog door will help you keep the cold outside of your home during the winter. If you get annoyed by the sound that the door makes every time your pet gets in and out of the house, then this model will make you forget about this. This door has a magnetic closure which will also make it possible for the cold to remain outside. It has a self-locking and removable panel. If you have a dog that really likes to bite things, then you have to know that the bottom of the sliding door is not as smooth as not to be broken if the little one chooses to gnaw on it. Your dog will definitely enjoy playing outside the house by getting out through this door. This model has an aluminum frame and a plastic telescoping tunnel. The double-flap design will keep the cold out of your house and will make it more entertaining for your dog to go play outside. Moreover, these flaps are replaceable. It is suitable for dogs under 100 lbs. You have to take care with the plastic pieces that create the pass through the wall, because they are very thin and can be easily broken if you do not install the door carefully. This item is effective, convenient, and even looks good, for a change. Your dog will definitely like it. We know that there are a lot of great products available nowadays and that it may be very hard for a customer to choose the best one. Of course, we cannot decide for you, but we have some recommendations instead. We have listed some of the most popular dog doors for cold weather below and, who knows, maybe you will find the model you have been looking for among them. Does your dog like snow but you, on the contrary, like to stay in the house when it’s cold and wet outside? More than that, were you looking for a door for your dog that has a telescoping frame? Then this product might be the right one for you. This Ideal Pet Products model is made from structural foam molded plastic and it also has clear vinyl insulated flaps. If your dog does not have more than 90 pounds, then this is just the right door for your house. It is very easy to be installed and it is also secure. If you do not want to let your dog out and, more than that, the dog treats have no effect on him or her, for example, then the door slides down over the flaps and the pet will not be able to leave the house. You will not have to take care of opening and closing the door for your dog anymore, since your pet will have a personal entrance now. 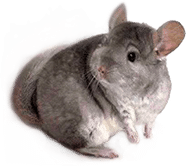 If your pet likes chewing and biting the dog door instead of going outside and actually playing, then you might consider this product, as it is reported as being bite and chew tested. More than that, if you do not want to hear the annoying noise of that door when your pet gets in and out, then this BarksBar item helps you get rid of the problem. This is due to its soft and flexible vinyl flap that has a magnetic closure. It will not help just you, it will also be easier for your dog to use it and it will also prevent the cold from going into the house. 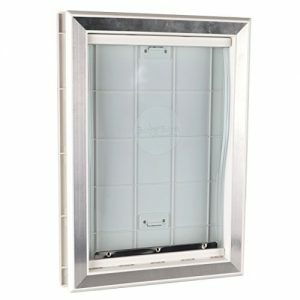 The panel of the product is self-locking and removable. If your little friend does not weigh more than 100 lbs, then this model may suit your needs. However, you still have to take into account if your pooch wears dog winter coats – measure the pet with the coat on. 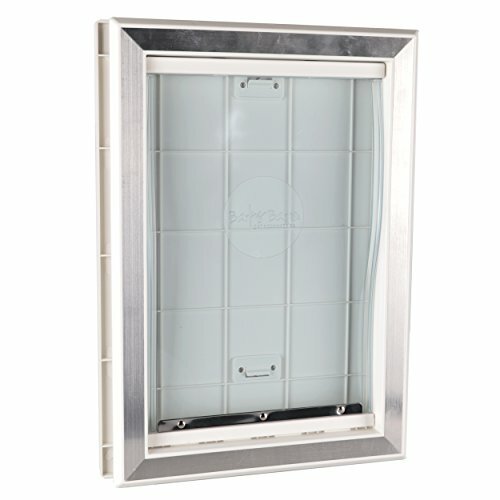 The aluminum frame and the plastic telescoping tunnel make this item durable and resistant. You will not have to change the dog door as often as you have probably done until now. 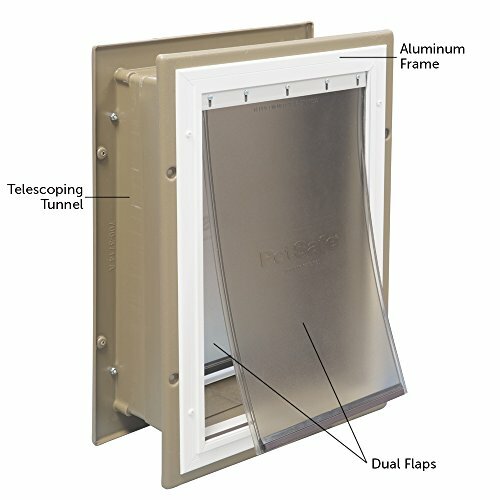 Moreover, the double-flap design makes the product unique, since it has two replaceable flaps that will definitely keep the cold weather outside your house and that will provide efficiency, as well. It is very easy to install, you will not need a handyman for doing this. The PetSafe door may be installed into different types of walls: all types of siding, brick and stucco. The model comes with a step-by-step instruction and with a cut-out template, as well. Your dog must weigh up to 100 lbs if you want your fluffy one to actually get back into the house after going for a run while you are taking out the trash. But make sure that the dog winter jacket of your pet is not too fluffy if the pooch is very close to 100 lbs. 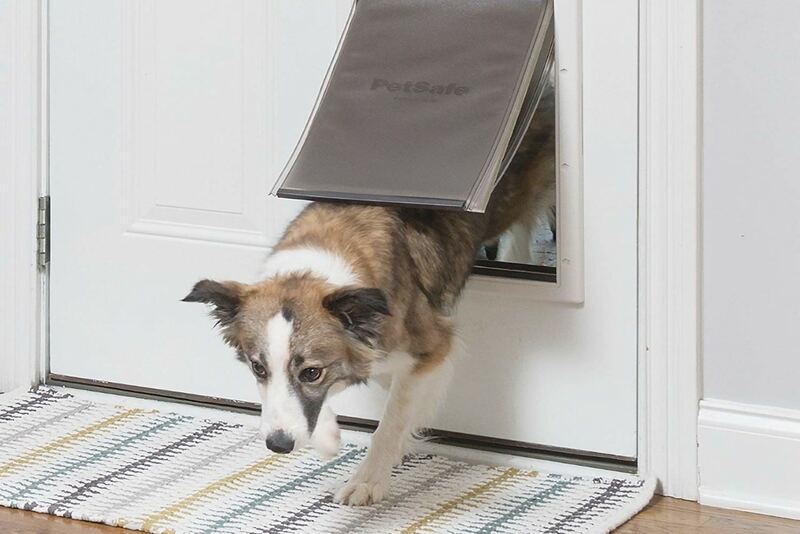 This stylish and well-designed pet door will give your guests the impression that your paw is coming out of a spaceship – because it has a black-tinted flap and a plastic flame that looks reinforced. Joke aside, it does look quite fancy and futuristic – it is therefore fit for a modern, minimal house. Moreover, this product is also equipped with an inner telescopic frame, making it highly durable, efficient in terms of energy, and suitable for all types of weather – including the stormy way your pet might act like when coming inside. Insulation is no serious issue for this item. You don’t have to stop your dog from getting in and out of the house too many times during cold weather. 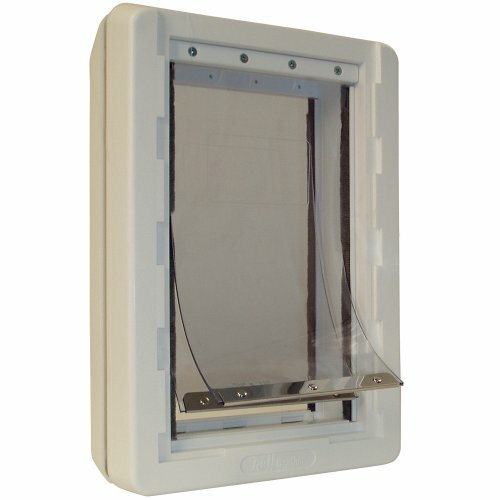 This is due to the frame of the pet door, which is made out of structural foam and molded plastic, which also has two vinyl flaps – ensuring insulation. You can let your dog enjoy his or her winter dog walking boots while getting out through this door! One to many times, you’ve probably heard noises from downstairs during the night, signaling the fact that your pet got bored of sleeping. In such cases, you’d have to stall your sleep, get off the bed, grab a pair of cold weather dog boots in case winter is coming, and go search for your pet. However, you won’t face this kind of issue with this product – it comes equipped with a locking cover that’s sturdy and secure enough to stop your dog from getting outside. Of course, you might hear him or her whimpering in the night, but that won’t last long and you’ll be able to sleep well. 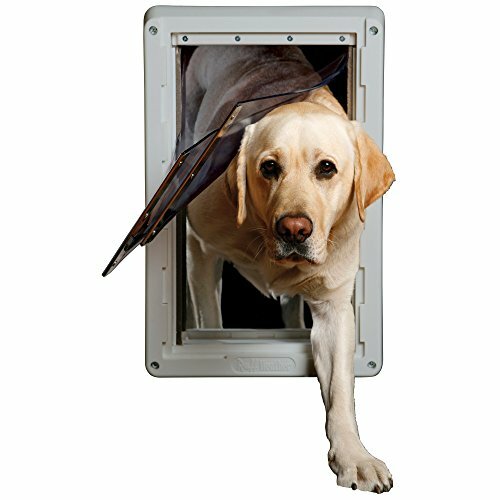 Moreover, this product features insulation, to protect your household from the cold winter days – but that doesn’t mean it is a stiff dog door. Its design, while safe, is also quite flexible and durable, so you won’t have to replace it for a long time. If you thought that choosing a dog door that’s capable of offering you protection against all types of weather is easy, you are not entirely correct. Going to the store and choosing the thickest product you can find won’t give you that sort of protection. Therefore, we have come up with a buying guide for you, in which we analyze the features that a good dog door for cold weather should come with. There are different types of dog doors, so you have to know these in order to choose the one that suits your necessities. A traditional flap door may be a good choice if you want to install it on a door that allows the access to a garage. But it will not be a good choice to be installed on the main door, because it will not prevent the cold from getting into the house. The magnetic or electronic door may be a great option for chilly days since it prevents the cold from getting into the house. This is due to the fact that the door remains locked if the fluffy ones do not use it, just like the last type of door – the hard plastic one. The dimensions of a dog door are very important, because if the door is smaller than the pet, it will be of no use. Thus, you have to pay great attention to this when choosing such a product. Carefully measure the size of your dog and decide what model will be the best for you to buy. If you have more than one dog, choose a door that will be as big as to fit the biggest pet you have. It will do no harm to a little dog if you install a bigger entrance. When choosing a dog door out of all the products that are up for sale, it is very important to pay attention to the degree of isolation it presents. You definitely do not want the winter cold to get into your house. Choose an item that locks automatically, so that the cold stays outside. You will get tired of always locking the door after your pet gets in or out of the house if you choose a standard model. You should also take into account the design of the door, since it has to fit the one of your house entrance. Just find a model that is more appropriate in looks and features for the design of your home. Therefore, we recommend you to be very careful when you choose a door for your lovely friend. Just as we carefully choose a stylish, fancy and durable entrance for our houses, the little ones also want to be taken care of and enjoy a quality and comfortable door.